A number of products to help reduce snoring have been introduced into the market over the years. Among them are anti-snoring pillows. For some people, snoring, whether by their partner or themselves, is a big impediment to sound and comfortable sleeping. It is a result of obstruction of the air way as you sleep that causes the respiratory structures to vibrate. While snoring might not be that big and issue for some people, others require some help to enable them to reduce it and sleep better. 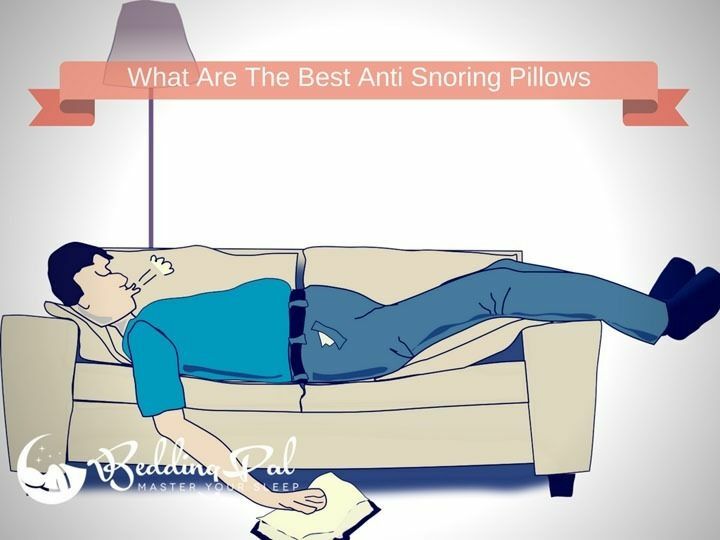 In this guide, we explore some of the best pillows for snoring; what they are, how they work, their benefits, and, who needs them. To make it easier for you to chose the best snoring pillow in the market, we also review five of the best available options. Who Needs A Snoring Pillow? Keep Your Airways Open: By improving the alignment of your head and neck, these pillows help to keep your airways open as you sleep. This, in turn, helps to reduce and, or, eliminate the vibrations in your throat caused by the air you breathe in your sleep. Improve Sleep: They help to improve sleep. By reducing snoring, not only do these pillows help to improve the snorer’s sleep but they improve that of their partner as well. People with snoring partners are able to sleep better as a result of the reduced noise. Improve Posture: They help to improve your sleeping posture. Anti-snoring pillows are designed to cater to the needs of different sleepers. Regardless of your sleeping position, these pillows help to align your neck and head in such as a way as to avoid blocking your airway and consequently reducing your chances of snoring. 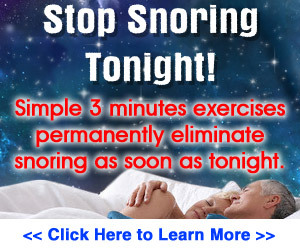 Easy Solution: They offer a safe solution to snoring. Unlike mandibular advancement devices, tongue restricting devices and surgery, anti snoring pillows offers snorers a non-intrusive solution to their snoring problem. Snoring pillows are designed with snorers in mind. They are essentially orthopedic pillows that are designed to improve breathing as you sleep. Since snoring is as a result of an obstructed airway during sleep, snoring pillows work by improving the alignment of your head and neck thus keeping your airway open. They have been known to greatly reduce and in some instances completely stop snoring for mild snorers. They are, however, not a full proof solution to the condition. Snoring is often influenced by one’s sleeping posture. Back sleepers are the most susceptible to it. Sleeping on one’s back causes the tongue to slip back and block the airway. For back sleepers, a contoured snoring pillow is likely to be the best fit due to the support rendered the back of the neck as well as the support given to the head by this pillow design. Side sleepers have a lower chance of snoring than a back sleeper. That notwithstanding, some side sleepers are still faced with mild snoring issues. In such cases then snoring pillows would work to improve posture and eventually improve their sleep. These pillows will take some time to getting used to and some people may find them uncomfortable at first. If you are unable to adjust to using an anti-snoring pillow then it is advisable that you seek out alternative anti-snoring solutions. Snoring pillows come in different shapes and forms. They differ also in the materials used to manufacture them. They are generally categorized into wedge pillows, contour pillows, CPAP pillows, cervical support pillows, memory foam and latex pillows. Memory Foam pillows are considered anti snoring pillows due to their ability to firmly support your head and neck. Their ability to adapt to the natural contours of your head and neck is also beneficial when it comes to decreasing instances of snoring. Contour pillows are designed to aid your head, neck and shoulders achieve the ideal alignment when you sleep. These pillows have a concave depression in the middle while the edges are thicker and firmer. This shape is important for holding your head in place as you sleep as well as keeping the airways open, preventing you from snoring. Wedge anti-snoring pillows are built to take a wedge shape. They are popular amongst snorers, and more so back sleepers, due to their ability to raise, and support the head, neck and back as you sleep. By doing so, they keep your tongue from slipping to the back of the throat and obstructing the airway. CPAP pillows are used together with continuous positive airway pressure (CPAP) machine to help keep CPAP machine users comfortable throughout the night. CPAP therapy is useful for those suffering from heavy snoring as well as sleep apnea. It works by increasing pressure on the throat, forcing the airway open. Users of CPAP machines are required to wear an oxygen mask over their mouths or face as they sleep. As such, movement during the night may cause the mask to be displaced, reducing its effectiveness. CPAP pillows are, therefore, designed to provide adequate support to the head and neck and to keep the CPAP mask from moving as you sleep. Neck cervical support pillows that work best for snorers. These pillows are designed to cradle the neck and head while allowing the rest of the spine to relax. Another great alternative is the Smart Nora Anti Snoring Solution which is not exactly a pillow but works in a unique way that helps to prevent snoring. If you did a quick internet search looking for the best anti-snoring pillows in the market today, you are likely to be bombarded with multiple pillow options all claiming to be the most effective. The growing need for anti-snoring devices has seen a number of products being introduced to the market. However, it is important to figure out what to look for in a snoring pillow depending on your needs. The Type Of Material Used: Anti-snoring pillows are made from a wide variety of materials; from polyester to latex foams. The type of material used to manufacture a pillow will determine the pillow’s quality as well as its durability. Memory foam pillows are preferred to other foams due to their ability to maintain their shape even after continued use. Opting for a pillow made of high quality and durable materials is important as it cost effective in the long run. Your Sleeping Position: The type of pillow that you settle for will be influenced by your sleeping position. If you are a back sleeper, a wedge pillow or a contoured pillow would be best suited for you. Side sleepers may find contoured or neck cervical support pillows more comfortable than wedge pillows. Comfort: The ultimate purpose of a pillow is to give you a comfortable sleeping experience. This function cuts across all pillows regardless of their design and functionality. Compromising on comfort may lead to the development of aches and pains in the neck, back, and shoulders. You would, therefore, be trading one sleep discomfort for another. Budget: The financial implications of owning an anti-snoring pillow are important to keep in mind whenever you are shopping for one. Keep in mind the maximum amount you are willing to spend for this type of pillow and work towards finding the best quality pillow within this price range. Support Provided: Another basic function of a pillow is to help support your head, neck, shoulders and back as you sleep. Without this supportive feature, a pillow is pretty much useless. For anti-snoring pillows, their effectiveness at offering adequate support is what gives them their anti-snoring capabilities. An anti-snoring pillow that fails to effectively support you while you sleep may eventually do more harm than good, making your snoring problem worse. Size Matters: When considering an anti-snoring pillow, keep in mind its size. The size of the pillow should be matched with its intended use as well as the size of the bed. If you are one to travel frequently, then a smaller pillow might be more suited to your need as opposed to those of someone who does not travel as often or at all for that matter. If purchasing it for a home pillow, the size of the pillow will influence your comfort. There are numerous varieties of snoring pillows available in the market, and we have listed the detailed information of 5 of the best pillows that would certainly help you in your selection for one. In order to keep you from snoring, an anti-snoring pillow needs to be able to provide ample support for the head, neck, and shoulders. The Celliant Sleep Therapeutic Wellness Anti Snore Memory Foam Pillow by VISCO LOVE US LLC has earned a place in this guide because of its ability to do just that. It is designed using elastic materials that cause it to adapt to both heat and pressure. This, in turn, helps it take up the natural contours of your shoulders and neck improving its ability to properly align them and maintain an open airway as you sleep. Apart from improving your sleeping posture and helping to reduce your snoring events, this pillow helps to guard against neck and shoulder pains that result from a poor sleeping posture. It is designed to thermo-regulate through the use if air channels incorporated in the pillows core. This is important as it keeps the pillow from warming up and becoming uncomfortable to sleep on. It is rather easy to maintain. It comes with a washable zipper cover that is easy to clean. Another plus to it is the fact that it is compatible with CPAP users that suffer from sleep apnea. The ideal anti-snoring pillow is sturdy enough to provide the necessary support and alignment while remaining comfortable enough to encourage a restful night. The InteVision Foam Wedge Bed Pillow fits this profile. This wedge foam pillow is made by combing a firm foam base with a layer of memory foam. The former is effective in providing support while the latter is used to improve the comfort. This pillow is useful for raising its users and helping to better align the head, neck shoulders, and spine. This in turn not only helps to reduce snoring but also comes in handy to reduce cases of acid reflux and improve circulation. To ensure that it is easy to maintain, the pillow comes with a washable cover that is easy to remove and can be machine washed. This versatile pillow is not only useful for supporting your back and upper body, it can also be used to prop up your legs as you sleep in a more comfortable sleeping position. The Xtreme Comfort Slim Hypoallergenic Shredded Memory Foam Standard Bamboo Pillow has earned a place in this guide due to its ability to provide adequate support for back sleepers. This thin pillow is stuffed with shredded memory foam which makes it possible to mould and adjust as needed. Due to its thinness, it keeps the head from raising and straining the neck and lower back as you sleep. The resulting improvement in your sleeping posture not only helps you breathe better at night but keeps you from developing back and neck pains as well. This pillow is also designed to be breathable; a feature necessary to ensure effective thermo-regulation. To improve its breathability, manufacturers make use of kool-flow technology in their bamboo covers. These covers have micro vents that help to keep heat and moisture from accumulating as you sleep. This, in turn, keeps you from interrupting your sleep in order to turn your pillow on its cool side. Another reason for this pillows inclusion in this guide is its hypoallergenic features and the fact that it comes with a washable cover. These features keep dust from accumulating on the pillow making it easier for you to breathe at night. Snoring is sometimes as a result of blocked nasal airways that can result from irritations such as dust allergies. It comes with a six-year warranty and a 30-day money back guarantee. Poor support and improper alignment of your spine will cause you to not only develop breathing problems as you sleep but will also cause you to develop pains in your neck, shoulders, and back. The Bed wedge pillow with a memory foam top by Cushy Form has been included in this guide due to its ability to adequately support the upper back body as you sleep. This feature is particularly helpful for those suffering from sinuses and for those who have recently undergone some form of surgery in the upper back body. The pillows allow you to convert an ordinary bed into a recliner in order to achieve better support for your upper back as well as your shoulders. You can also use it to prop yourself up when reading a book or simply watching your favorite show on television. It also comes in handy for propping up your legs. It, therefore, allows you to improve your posture as long as you are sitting or lying down, regardless of the activity you are undertaking. To improve the comfort derived from using this pillow, the top is made from memory form. This helps the pillow easily adjust to the natural contours of your upper back body so as to provide better support. The cover also helps to keep your body in place. You, therefore, do not need to keep waking up to reposition yourself on the pillow. It is also breathable making the pillow better at heat dissipation and keeps moisture from building up and making you uncomfortable as you sleep. Lastly, the cover is washable. This is good news for all as it makes the pillow easy to maintain and keeps dust and grime from accumulating. This pillow comes with a 100% money back guarantee should you find it unsatisfactory. We all look forward to a good night’s rest and that fresh, rested feeling the morning after. You need to have a comfortable bed and a comfortable pillow in order to achieve this. The Comfylife hypoallergenic bamboo Memory Foam Contour Pillow is included in this guide as it has been found by a good number of users to achieve these desired results. It makes use of a wavy, contoured design that enables it to provide the much-needed support to the head, neck, and shoulders as you sleep. It is compatible with a variety of sleeping positions and has been found to be useful for the side, back and stomach sleepers. By ensuring that your head, neck, and shoulders remain in place regardless of your sleeping position, this pillow helps to improve your spinal alignment, and open up your airways, reducing your chances of snoring. To help improve the comfort of this pillow, the manufacturers have included a breathable bamboo cover. This helps to keep the pillow cool even as your body emits heat as you sleep. The pillow’s hypoallergenic properties help you breath better at night. This is especially so for people who suffer from dust allergies. The fact that the cover is washable also helps to keep dust and grime from building up. Anti-snoring pillows on the market today are sold with the promise of reducing, and in some instances, eradicating your snoring problems altogether. This is, however dependent on the severity of your snoring problem. For light snorers, anti-snoring pillows might work to stop your snoring altogether. However, the use of such a pillow, especially for heavy snorers, may prove harmful rather than helpful in the long run. If you are a heavy snorer, be sure to confirm with a sleep doctor that you are not suffering from sleep apnea before you choose to use an anti-snoring pillow. Sleep apnea may prove to be fatal if not checked early enough. That being said, there are a number of factors that one needs to consider when purchasing the best pillow for snoring. While the price tag that comes attached to the pillow is an important consideration, your comfort is an even greater consideration. Be sure to also shop around and look at the experiences of other users with similar problems. Hope that helped. Check our homepage for more interesting articles.